To Order: contact Zoe via email or phone regarding availability or to try on, payment by EFT and orders will be posted within two days. Riding with Feel is a practical guide for riders of all standards and all disciplines who want to improve their ability to communicate with their horse when riding on the flat and over jumps. It is the only book to deal entirely with the subject of developing the rider's ability to feel. Zoe Harrison leads the rider through a series of techniques and exercises, some mounted and some dismounted, to increase their awareness of their own body and to more clearly feel their horse's movements and response to the aids. This book will also be useful for coaches and instructors in guiding their students of all levels and all ages in the development of feel. Riding with Feel is illustrated with line drawings and covers topics such as rider position, body awareness, application and timing of the aids, fitting of saddlery and the horse's balance and movement. 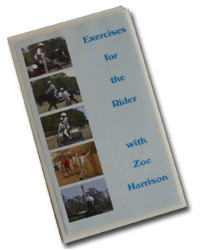 Exercises are clearly explained in the text and presented in summary form in each chapter to further assist the rider in their training sessions. The splendour of a horse and rider in full flight is appreciated by all who witness it. Those directly involved in the wide range of equine pursuits have an even greater appreciation - for they understand what is needed to reach such harmony with these magnificent animals. This DVD examines key terminology associated with riding at all levels. Clearly explained and visually backed, it provides the rider with correct and incorrect examples of important aspects of riding. 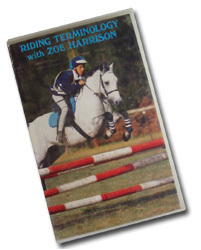 Riding Terminilogy is presented by Zoe Harrison, an NCAS level 2 coach who is highly regarded as a rider, coach and lecturer in Equine Management Studies in Western Australia. By highlighting 'contact', 'impulsion', 'behind & above the bit'. 'bend' and many others, Riding Terminilogy provides valuable information for riders and coaches of all abilities. In an entertaining and informative manner, Riding Termology aims to improve communication between horse and rider in their quest for success and sheer enjoyment! This video examines key terminology associated with riding at all levels. Clearly explained and visually backed, it provides the rider with correct and incorrect examples of important aspects of riding. There are several key factors which combine to produce high quality athletic permance - balance, position, strength and flexibility. For the rider to fully enjoy their riding and for the horse to perform in harmony, these qualities are essential. This second training DVD presented by Zoe Harrison highlights the importance of pre ride warm up and stretching, exercise and diet. Exercises for the Rider provides the novice and the expert with a range of exercises specifically designed to improve the riders seat, hands and overall balance. The DVD clearly demonstrates the exercises and is well supported by instruction making ot an ideal tool for coaches and a must for any rider's DVD collection. Exercises for the Rider seeks to maximise the enjoyment for both horse and rider in order to create an ideal environment for furthering the special relationship between them. This second training video presented by Zoe Harrison highlights the importance of pre ride warm up and stretching, exercise and diet. The video clearly demonstrates the exercises and is well supported by instruction making ot an ideal tool for coaches and a must for any rider's video library. Endorsed by Equestrian Australia, Pony Club Association of Western Australia and the Australian Horse Riding Centres. 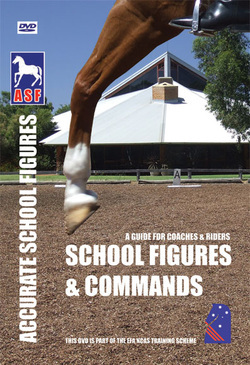 Accurate School Figures - School Figures & Commands DVD, produced in WA by Dwight Pedlow, an EA NCAS Level 2 General Coach, Coach Educator, Assessor and “E” Level EA Dressage Judge, this DVD is a new training resource which has become standard issue in the EA NCAS Training Workbook for Intro and Level 1 Riding and Coaching certificates. Nathan Holman, EA National Education Manager, says the DVD is “an ideal resource that encompasses multiple learning techniques in an easy-to-use format. It will be a great addition to the Coach Training Packages and a useful reference for all coaches and riders”. 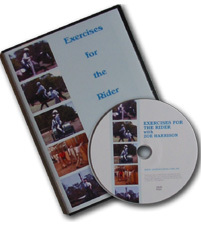 The DVD is now on general release so riders may purchase it to help improve their training techniques whatever discipline they ride, as the DVD is designed to be used by individuals for self help or with groups in training sessions. The DVD covers all the frequently used school figures, as well as additional exercises with a running time of approximately 60 minutes. 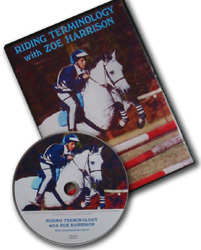 Using a combination of riding video clips, graphic animation and a summary of “action points” as the key points to remember, the DVD demonstrates the correct riding technique for each movement and highlights the technical components for the accurate riding and coaching of school figures. 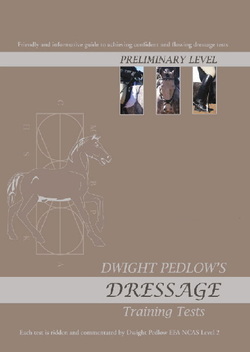 Watch, listen and learn how to achieve a confident and harmonious dressage test with this great new DVD by Dwight Pedlow EFA NCAS Level II General Coach, Coach Educator, Assessor and "E" level Dressage Judge. Starring TEAM TONIC, Dwight rides all the PRELIMINARY tests (P1.1, P1.2, P1.3 & P1.4) and talks you through each element as a guide to presenting the very best of the horse and rider to the Judge. Features a “Hints and Tips” section on specific manoeuvres including Serpentine, Figure Eight and the Halt & Salute, plus dressage arena etiquette.